As part of my “30 before 30” challenge, I’ve decided to try to tackle at least one new recipe every month. This means the recipe has to be somewhat of a success to count toward the challenge. For instance, the basil and dill eggs I managed to catch on fire the other night would not count (we have a glitchy burner that has no concept of “low heat,” which I was not aware of). Last week I was in the mood to cook Pete dinner (this rarely happens as he is almost always the maker of dinners), so I headed to the grocery store and flipped through an issue of Taste of Home magazine. 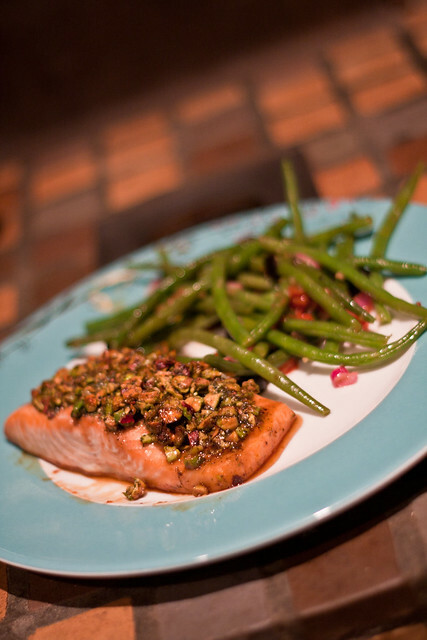 I decided to make the Pistachio Baked Salmon, which sounded easy enough. That was before I realized most cooking magazines assume you have a food processor and a grocery store that sells unshelled pistachios. Needless to say, I spent a good 35 minutes taking the shells and skin off of pistachios and chopping them up, but it’s not like I had anything better to do while watching Bethenny Getting Married. Anyway, below is the recipe for you fellow salmon lovers out there! I think it was pretty darn tasty, especially since I am notoriously known as the girl who can’t even microwave Easy Mac without the smoke alarm going off (note to self: next time, add water). 6 ServingsPrep/Total Time: 25 min. Place salmon in a greased 13-in. x 9-in. baking dish. Combine the remaining ingredients; spoon over salmon. Bake, uncovered, at 425° for 12-15 minutes or until fish flakes easily with a fork. Yield: 6 servings. Nutrition Facts: 1 fillet equals 505 calories, 28 g fat (5 g saturated fat), 100 mg cholesterol, 194 mg sodium, 25 g carbohydrate, 2 g fiber, 39 g protein. Check it out, it even vaguely resembles the magazine photo! Are there any others out there who are helplessly trying to tackle the kitchen after years of microwaveable dinners?